The HTC Desire 700 dual sim is reporting for battery testing duty with a 2,100 mAh juice pack, the only 200 mAh smaller than what the HTC One has. With a screen of far lower resolution and a far less demanding chipset it actually looks capable of beating its elite stablemate here. 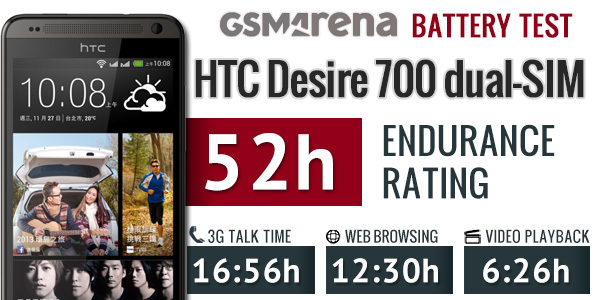 The Desire 700 dual sim is quoted at 582 of stand-by and close to 12 hours of talk time. Can it live up to the claims? Results are inside. Talk time was the most impressive for the Desire 700 and that’s with two SIMs running. It was 4 minutes shy of 17 hours, which more than surpasses its predicted score. Hat tip for the Desire here – it’s very important for dual sim devices to have good talk time as there’s no use for two SIMs in a dead phone. Web browsing continues the good streak with the Desire 700 dual sim capturing a spot in the top 5 of the table. The actual score is 12 and a half hours, which is impressive by any standard! Finally the video playback test yielded quite disappointing result from the Desire 700 dual sim. 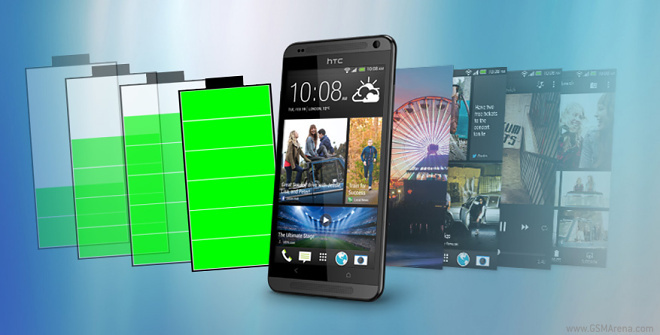 The Desire 700 dual sim scored just 6 and a half hours and ended up close to many of its HTC siblings. The score is pretty low, particularly considering the web browsing achievement. So when we round things up and add the stand by time of the Desire 700 dual sim we get a good score of 52 hours of usage in between charges. That’s if you perform and hour of each test we mentioned per day. With handsets like the Desire 700 dual sim, good battery life can go a long way in front of potential buyers. Will the rest of the smartphone performance keep up – the review is hitting our homepage in a few days with the answer.